Attorney Jose Pertierra denounced the confessed terrorist Luis Posada Carriles argued before the Federal Court of El Paso, that his long years of work with the Central Intelligence Agency (CIA) had misled him, confused him and that he was suffering from memory loss. In a motion filed Thursday at that court, where he was prosecuted for perjury, not murder, Posada Carriles had that curious defense when questioned by immigration officials shortly after illegally entering the United States in March 2005. 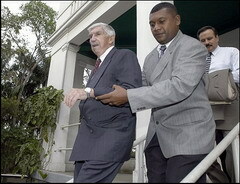 Pertierra notes in an article reproduced by Granma newspaper this Friday that Posada claims that during its course of employment with the CIA, he used several false identities and passports to facilitate his work underground against Cuba, Venezuela and other Latin American countries. So many lies confuse him now, his legal team argues in the 14-page document submitted to Judge Kathleen Cardone. Pertierra says that the government wants to exclude from trial all evidence of the relationship of Posada Carriles with the CIA, saying that it was not relevant and that is confidential. That's because, clarifies Pertierra, Washington knows Posada has much to say and it is trying to limit the testimony and evidence as much as possible in order to prevent the crimes committed by Posada Carriles through decades of work for the CIA from coming to light. There are declassified CIA cables and confessions of the perpetrators of the crime which state that Posada masterminded the bombing of a Cubana airliner Aviation on October 6th 1976, when 73 people died, the lawyer recalled. He also recalled that Venezuela filed a request for his extradition in June 2005 and it is still pending without the White House answering to it, and that Posada confessed to The New York Times in 1998, that he orchestrated a terrorist campaign against the hotels and restaurants in Havana. These actions resulted in the cold blood murder of Italian Fabio Di Celmo, in the Copacabana Hotel, in which several others were wounded. In previous documents, Posada claimed that everything he did in Latin America was "on behalf of Washington"; he knows that the more he threatens to tell of his relationship with the CIA, the more trembling from those who hide the skeletons in Washington, says Pertierra.